One thing I discovered while taking photos of lightning last Wednesday was be prepared for the rain. Thank goodness I was within 15 feet of my garage when the rain started falling from the sky or my camera would have gotten soaked. I'm making a mental note, if I'm out taking photos of lightning, have a plastic bag to throw over the camera handy to keep the rain drops out. 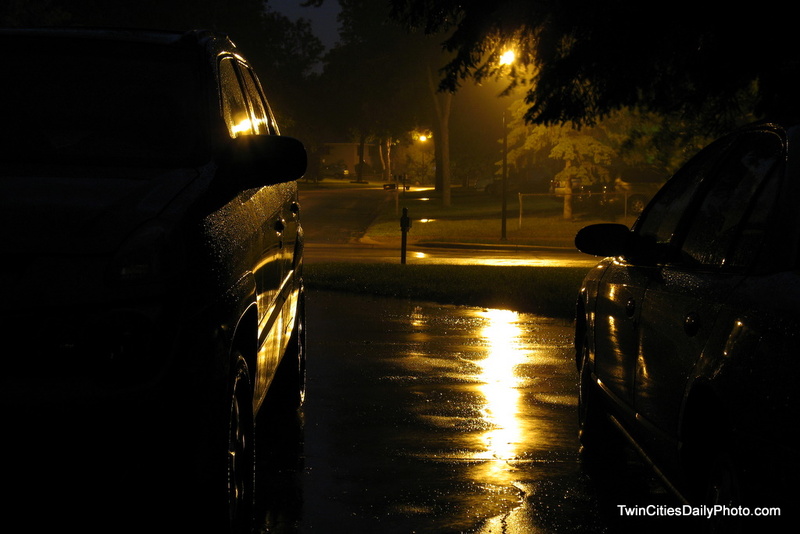 While I was watching the rain fall, I snapped a couple of photos between my vehicles parked in the driveway. I really like the effect the rain had on the street lights. I like the moodyness of rain and lighting.